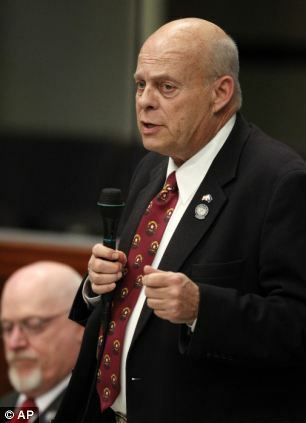 A Nevada assem blyman came under fire Monday after a YouTube video surfaced in which he told a Republican gathering he would vote to allow slavery if that is what his constituents wanted him to do. ‘If that’s what they wanted, I’d have to hold my nose … they’d probably have to hold a gun to my head, but yeah,’ Assemblyman Jim Wheeler told members of the Storey County Republican Party at a meeting in August. ‘It’s time for Jim Wheeler to find a new line of work,’ Roberson said. Wheeler, a freshman lawmaker representing District 39, said his remarks were taken out of context and that he was trying to make a point that he was elected to represent his constituents. Reached late Monday, Wheeler said he was falsely being portrayed as a bigot.